There has been an interesting “Do we like Sunderland or is it just because of Keano?” debate running at the Irish football site eleven-a-side.com which some of you will have seen. A quick scroll down the comments field left me with the impression that the present, growing level of Irish support is not destined to last. There are plenty of people with soft spots, a smattering of SAFC fans weighing in but also a good deal of candid admission that once Roy Keane moves on “to a bigger club”, “allegiance” to the Lads will instantly be dropped. Let’s leave aside the phrase “bigger club”. I think they mean Man Utd, though most of us would naturally question either the adjective or the noun (bigger brand would work fine and raise no eyebrows here). That doesn’t mean we should resent the fair weather Irish folk who support us now……..
Football is full of people who support the wrong team or the right team for the wrong reasons. The right reason to support a team is that you were born or grew up in the town, city or area in which they play, or that your links are so strong (born in the Home Counties of Mackem parent/s would be a good example, and there are many of those) that any other choice would seem unthinkable. In the case of Sunderland, the catchment area has always been immense, stretching throughout the towns and villages of County Durham, into the Tyne Valley and so on. I was born in Sussex, was moved to the North East – Shildon – as a baby and have links galore with the region, Sunderland included. My father, who served as secretary of Shildon AFC in the Northern League, took me to see SAFC at Boro, when Brian Clough scored the only goal (for us, not them) and I was hooked. I look for Shildon results, as I do for those of several other clubs, but the notion of a second team escapes me. The Irish are different. North and south, they have always – if they follow football and do not stick rigidly to Gaelic sport – had their preferences in the English and Scottish leagues. There was – is? – a thriving Man Utd merchandise store in Belfast city centre and the population’s religious/political split produces lots of Celtic/Rangers and Liverpool/Everton rivalry. Sometimes, reasons for supporting a team are less easily defined. A Protestant Belfast taxi driver once told me he followed Rangers, which I expected to hear, but also that he was also very fond of Sunderland “for Charlie Hurley”, which I did not – though I suppose it was at least encouraging in terms of sectarian stereotypes. Some years ago, driving around an estate in Portadown in journalistic pursuit of a man suspected of being a mass murderer, I saw a small boy playing in the street wearing not just a Sunderland top, but a brand new away top. I felt safer continuing my search for the killer than stopping to inquire further. Then there was the cameraman playing in a media five-a-side game in Belfast who also happened to be wearing a Sunderland top. “You a fan then?” I asked. “No, just liked the top,” came the reply. But aside from the Keane loyalists adding their comments to eleven-a-side.com, there are in fact many Irish people who have always held something of a light for the Lads. The brilliant folk singer and all-round showman Christy Moore is one – though his first love, in England, was Leeds. But I can recall meeting many more. They’ll still be rooting for us if and when Keane departs, and of course there is still likely to be a strong Irish connection thanks to Niall Quinn and Drumaville. As for those who are not, I am content to welcome them now, pretty much as honorary fans, and to accept that the nature of Irish football support places a natural limit on the durability of their affection. Perhaps you’re also seeing something new in football. Mobility – both for players and managers – has increased dramatically. You now also have a class of fan who supports an individual (so add that to the whole club V country debate). It’s an adoption from other sports. Take cycling. You support a rider, not a team. The team comes with the rider. Or take F1 – I was a fan of Schumacher back when he was cheating with Beneton. He moved to the Prancing Pony and so I became a surrogate Prancing Pony fan. Now, my F1 allegiance is drifting away, no team and no driver really catching my imagination. I’ll still watch the odd race and read the reports, but I don’t really cheer anyone on at the moment. Will the Irish desert Sunderland when Keane leaves? Depends on many things. The first is how many Irish fans are simply there for the bandwagon. It’s been a year of bandwagons over here, with the wheels coming off the Irish soccer team. First we leapt aboard Rugby, but the French stole our thunder. Then it was cricket. But we only won two games. Now it’s Keane’s magical debut season. Will the support still be there if Sunderland are languishing mid-table (or, perish the thought, struggling against relegation)? 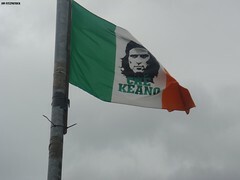 The other question is whether the Irish will leave just because Keane does. Hopefully you’ll still have Quinn. I really think he is in for the long term, and not the quick buck. And he’s the one calling for the Irish to adopt Sunderland as their second team. My brother is a die-hard MU fan – but has loved the Sunderland story this season. He’ll cheer Sunderland in the premiership, but when they face off against MU, you know who he’ll be wanting to win. Quinn is happy to have that sort of fan. Are other Sunderland supporters? Add to this the number of Irish players playing for Sunderland – now and hopefully into the future – and you’ve a lot of reasons beyond Keane to like Sunderland. Whilst I understand the widespread assumption that Keane will “eventually” leave us for Old Trafford, I’d question whether it isn’t based on “old-fashioned” criteria. In the current European driven climate of the top clubs, won’t Man. Utd’s finance-motivated owners want a manager with proven UEFA competition experience? Or am I just kidding myself in hope? In recent talk-ins Niall Quinn has said he doesn’t think club chairmen should stay too long in the job. I think he was just trying to prepare us. Roy Keane’s on a 3 year contract and hasn’t so far extended to 5, but it’s not certain that he’ll leave one day for Old Trafford. If we’re successful and he comes to identify closely with the club and the region, who knows? As for supporters, I’m happy for everyone to join in, whether making a trip to the SoL or watching from a bar in Cork. The culture of the club is changing anyway. Now, few supporters will have spent a morning in heavy, manual labour before coming to the match but the pride and passion characterising the area lives on through the club. I hope we never lose that identity, even if we’re playing in Europe to worldwide audiences in red and white. Thanks for sharing with us.Good job just keep it up!! !